A huge part of the One of Seven Project is breaking down barriers that keep us from getting outside and following our passions. The gang over at Bikepacking Roots is all about breaking down barriers and following their passion. They look to grow the sport of bikepacking. This is one reason why you should support Bikepacking Roots. As a fairly new and growing sport Bikepacking needs a voice. There’s no better voice than that of Bikepacking Roots. This is why I joined and plan to support Bikepacking Roots however I can. Bikepacking Roots is about creating new routes, providing and promoting visibility and access, and building relationships with bikepackers and landscapes in hopes of promoting land conservation and encourage responsible backcountry ethics. Bikepacking Roots was launched in May of 2017 by Kurt Refsnider, who is no stranger to bikepacking. Kurt has been bikepacking since 2008 and during his time in the saddle has learned what our growing sports needs moving forward. Create high-quality, enjoyable, accessible bikepacking routes and route networks in geographic regions throughout North America. Provide and promote visibility and access for the bikepacking community. 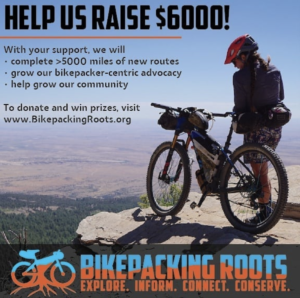 Foster strong connections between bikepackers and landscapes to promote landscape conservation and encourage responsible backcountry ethics. As our sport grows, it will need a bigger and bigger voice. A champion to help work with land management groups to preserve, open, and negotiate on our behalf. Bikepacking Roots is that champion. They are currently trying to raise $6000 for their latest effort. Please share this post and reach out to them today. You can read more and Support Bikepacking Roots here.